Will little critter find his mitt in all the mess? Just Me and My Little Brother by Mercer Mayer was published in print in 1991. It is a beloved story about Little Critter as he teachers his little brother the best parts about childhood. Evoking the classic tension between love and competition that is the halmark of sibling relationships, this book will enchant young readers while reminding them about the importance of family bonds. This digital version adds a new twist, having the reader try to find all the little mice (17 in all) hidden on every page, plus one cute spider. When the child taps on a mouse or spider, a chime sounds; at the end of the book, a page is displayed with the number of mice (of the total) successfully found. This little extra was a big hit with my kid and made re-reading a bit more fun. As a parent, I liked this interactivity because it rewarded my child for paying attention, although it did distract from the story on the first reading. Like other books by Oceanhouse Media, this app is interactive in a way that enhances early reading skills. Most images (of mom, Little Critter and many items in their environment), will name themselves aloud while the word briefly appears over the illustration. For example, touch a tree and the word "tree" appears and is spoken aloud by the narrator. If the word is also present in the text on that page, it highlights as spoken, providing nice auditory/visual word-reinforcement for young learners. 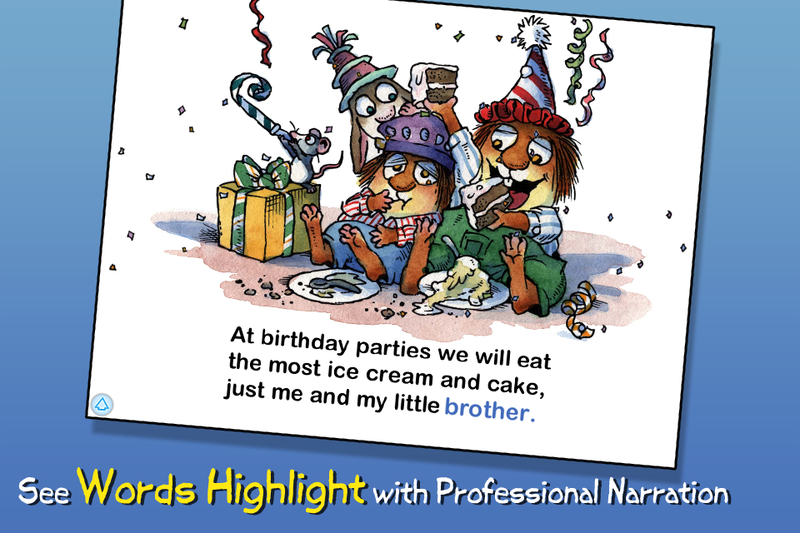 For early readers and pre-readers, the text also highlights as the narrator says each word. By the way, the young voice-actor is also easy to understand. I particularly liked the choice of child narration in the Little Critter book apps, since the story is told in the first-person. Overall, this is a cute book and a great read for children six and under.